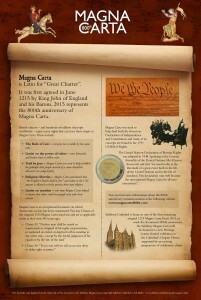 The Magna Carta 800th Commemoration Committee is encouraging local authorities to incorporate Magna Carta into Citizenship Ceremonies in 2015. The Committee has designed and is producing several thousand special copies of a Magna Carta facsimile – the front side has an image of the 1215 Salisbury Magna Carta and seal and the reverse side an explanation as to why Magna Carta is important today (pictured, left). Local authorities will be able to purchase these facsimiles and provide them to their new citizens throughout 2015. The first Magna Carta Citizenship Ceremony took place at Brent Civic Centre, where new British Citizens were provided with a facsimile and information about the Great Charter. This ceremony was held on 20th January to coincide with the BBC’s ‘Democracy Day’, which launched the Corporation’s coverage of Magna Carta in 2015 – a cross-channel season entitled ‘Taking Liberties.’ Programmes throughout the year have highlighted Magna Carta’s continuing relevance in the 21st Century. The facsimiles come with their own tube, and appear like scrolls. Magna Carta Citizenship Ceremony, Allington Castle, Kent. Sir Robert Worcester, Chairman of the 800th Committee and Deputy Lieutenant of Kent, hosted a Citizenship Ceremony at Allington Castle, Kent. New citizens were presented with Magna Carta scrolls. 7th September, A London – wide Magna Carta Citizenship Ceremony hosted by Mayor of London Boris Johnson. 19th November, House of Lords, hosted by Baroness Prashar of Runnymede. 2nd December, London – wide Magna Carta Citizenship Ceremony hosted by Brent City Council.